Barry Negrin, a registered patent attorney (Reg. No. 37,407), is counsel to the firm, and practices in the firm’s Intellectual Property Practice Group. 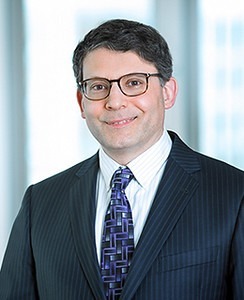 Mr. Negrin has enjoyed a diverse practice of patent and trademark law for over 25 years, managing the intellectual property portfolios of clients both domestically and internationally. During his career, Mr. Negrin has drafted patent applications and infringement/non-infringement opinions, has litigated patent infringement issues, and has conducted patent reexamination proceedings, all in a wide variety of technologies, including X-ray optical systems, rapid blood clotting treatments, social media monitoring and interaction, video software codec systems, biomedical devices, HVAC systems and related software and control units, magnetic levitation transportation, voice-recognition security systems, consumer electronics, rapid liquid cooling/warming technology, telecommunications software systems, software for developing and executing distributed applications, ultraviolet water purification systems, internet search functionality, and many others. He has also searched, cleared and prosecuted numerous trademark applications and has appeared before the Trademark Trial and Appeal Board of the U.S. Patent and Trademark Office. Prior to joining Kane Kessler, Mr. Negrin was the co-founder of the patent group at a New York based 125-attorney general practice firm. Mr. Negrin also has been recognized as a “Super Lawyer” in the 2014-2018 legal directory published annually by Super Lawyers, which is a listing of top rated attorneys in America. Mr. Negrin not only represents inventors but is one himself, having been issued U.S. Patent No. 7,601,096 on October 13, 2009 entitled Exercise Equipment Abuse Prevention Control System and Network Employing Same. Barry’s patent covers a control system to help prevent users of community or shared exercise equipment from spending too much time on the equipment and thus not allowing other users to use and enjoy the equipment. Represented international jeans manufacturer in patent litigation in federal district court and concurrent inter parties patent reexamination before the United States Patent and Trademark Office.